Image caption Mr Maduro said the vote would go ahead "with or without the opposition"
Mr Maduro said he wanted to add legislative, state and municipal votes to provide "democratic renewal". Opposition parties say the presidential election will be "fraudulent and illegitimate". Venezuela is going through a protracted political and economic crisis. It has suffered for years from high inflation and the chronic shortage of food and medicines. What is behind the turmoil? 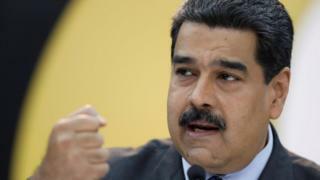 Mr Maduro said elections would be held "with or without" the Democratic Unity opposition coalition, which he accused of "erratic conduct". "A great parliamentary mega-election in the country, I am proposing it officially to the National Constituent Assembly for its consideration and let's go for some powerful, powerful elections for a democratic renewal of the country," he said. He said he wanted to bring forward other elections to "leave 4 years clear [of elections] at least". In a statement, the Democratic Unity coalition said April's election was "premature" and called for the government to hold "real elections" later in the year. The opposition's decision not to take part comes after weeks of wrangling following the decision of the National Constituent Assembly - a superbody which can overrule all other branches of government - to bring forward the presidential election from December. The constituent assembly is exclusively made up of government supporters. The opposition accused it of changing the date to take advantage of divisions within the opposition coalition. Its two strongest presidential candidates are both blocked from standing against Mr Maduro. Leopoldo Lopez remains under house arrest and Henrique Capriles is barred from office over misconduct allegations from his time as a state governor. Other charismatic opposition leaders have left the country for fear of arrest. Meanwhile the country's national election board, which supports Mr Maduro's government, has banned the Democratic Unity coalition and some of the main parties in it from using their official names in the election.